10/10/2014 - Armies of Zatikon on Android and Apple Store! 05/13/2014 - Kingdom Elemental Updated and Now on Steam! 12/18/2013 - Bridge It Plus available on Steam and more news! 07/01/2013 - Bridge It Widescreen support and Greenlight news! 11/28/2012 - Bridge It in the IndieFort Countdown Bundle! Gish Pick Your Own Price - Save up to 95%! In Pontifex you design and test bridges. Pontifex uses a complex physics engine which allows the construction of many different types of bridges. Once your design is completed, you can test the strength of your bridge by sending a train across it. Depending on the quality of the bridge's design, the train will either pass over safely or plummet into the river below. The 3D engine lets you view your bridge from any angle, including a first-person "strapped to the front of the train" view. Many different levels are included, from simple to complex, and a level editor allows you to make your own levels to trade with others. Gish isn't your average hero; in fact he's not your average anything. You see, Gish is a ball of tar. A Sunday stroll with his lady friend Brea goes awry when a shadowy figure emerges from an open manhole and pulls Brea into the ground below. Following Brea's calls for help, Gish suddenly finds himself in the subterranean sewers of Dross, a long forgotten city filled with twisting corridors, evil traps and some of the most demented creatures imaginable. Maneuver pieces so that three or more blocks of the same color are adjacent to each other. Touching three blocks of the same color together causes them to become "energized" before they are destroyed. "Energized" blocks will "energize" any other blocks of the same color they come in contact with. The more blocks destroyed, the more points for you. As blocks are destroyed, connected blocks are freed to move independently and will fall to fill the empty spaces. Unlike other puzzle games, the game board is a dynamic entity where the blocks obey the laws of physics. Every game is a new experience! Hey man, what are you doing sitting there? We've got asteroids to drill and gems to collect! Get off yer seat warmer and get your Laser Turret ready! We've got 90 levels to drill through, all with unique properties: how fast the asteroids fall, how many asteroids there are, different colored asteroids, and a few more surprises! I need you to catch the asteroids with your Laser Turret and guide them into their matching vacuum tubes...all the while grinding off excess rock to get extra points. So what are you waiting for, you'd better get to gettin' while the gettin's good! It's you vs. the mountain, the environment, and everyone! 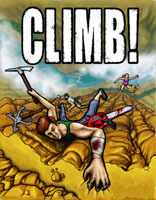 Climbers in CLIMB! will fight against dynamic environments, falling rocks, frostbite, cloud cover, lightning, lava and an array of outrageous weapons and gadgets in a mad scramble to the finish! Scale cliffs in various hazardous environments around the globe. Get to the top and brag to your friends, or fall to your death in a shower of ludicrous gibs. Are you good enough to scale the world's deadliest mountains?